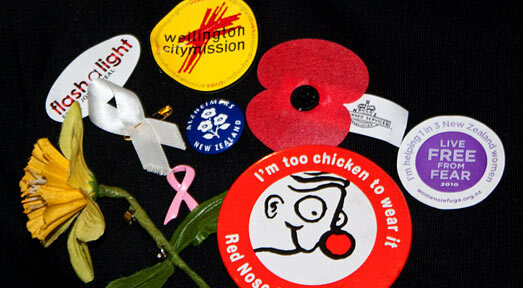 Red Anzac poppies, long sold on the street to raise funds for the RSA, have been joined by daffodils, bandannas and ribbons of various hues – all ways that New Zealand’s voluntary welfare organisations raise money to continue supporting those in need. Māori supported one another through tribal and family relationships. The first European settlers had informal support networks of neighbours, friends and family. In larger towns, charities were set up to help the needy. They often focused on women and children, believing men should be able to help themselves. Many people joined mutual-aid and friendly societies, paying a subscription so the society would support them if they got sick or needed help. From the 1880s churches – especially the Salvation Army and female Catholic religious orders – expanded their welfare work. They set up rescue homes for prostitutes and single mothers, as well as orphanages, soup kitchens and night shelters for homeless men. More welfare organisations were set up, including prisoners’ aid societies, shipwreck relief associations and societies to protect women and children. The government funded the Plunket Society, which supported mothers and babies, and the Foundation for the Blind. During the First World War almost 1,000 patriotic societies were formed to help refugees and soldiers, and a branch of the Red Cross was set up in New Zealand. During the 1930s depression, organisations such as the YWCA, the Red Cross and church city missions provided food, clothing, accommodation and other services to the unemployed. In the 1930s the first Labour government set up the welfare state. Some people thought charities would no longer be needed – but they continued to provide support and services. The Māori War Effort Organisation, based on tribal committees, was set up during the Second World War to encourage Māori recruitment. It also did welfare work, especially with Māori who had moved to the cities. From 1951 the Māori Women’s Welfare League focused on issues such as inadequate housing, discrimination, health and education. As more unmarried mothers kept their babies, women’s rescue homes closed. It was less acceptable for children to live in institutions, so church-run children’s homes closed too. From the 1960s and 1970s more women, Māori and disabled people set up their own organisations. In the mid-1980s the government contracted out social services to voluntary agencies, including a growing number of Māori organisations. Agencies had to compete for government contracts, and some felt their values were being compromised. While most agencies have paid staff, many also rely on large numbers of volunteers – traditionally mostly women. Elderly people, young people and immigrants also often volunteer. It allows them to learn new skills, meet people and help others.